When my first Highmaul follower mission popped up in my garrison, i was super excited. Finally i could send my gang out on meaningful missions with pretty awesome rewards. 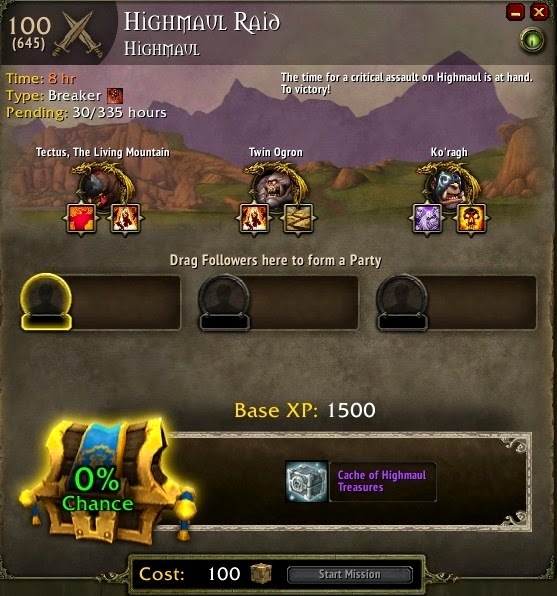 My excitement quickly subsided when i realized that my mission required counters from a follower i had not geared up yet. That one annoying bugger i really didn’t care for or had any interest in gearing of course had the counter i needed. The best i could do with what i had at the time had a 53% chance of success. What a bummer. Thanks to a neat garrison addon that told me how long the mission would be available to me, i started gearing up the follower i needed to counter some of these baddies. I must have spent the next week doing nothing but mission after mission for armor and weapon upgrades, as well as salvage crates. By the end of the week, i still had lots of time to complete the mission but little reason to wait any longer. My completion chance capped out at 82% with all my followers and traits available. I went for it not expecting much. After reading countless forum posts on this subject with players failing 90%+ missions, i expected to fail. 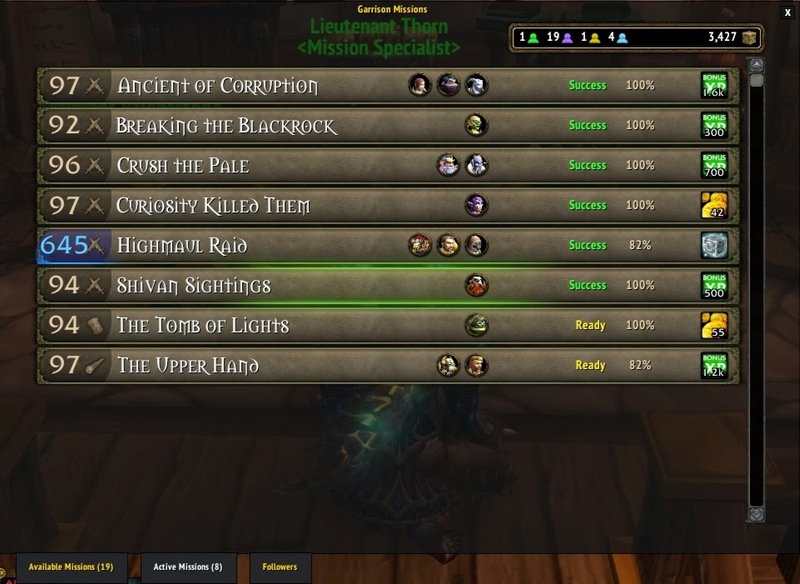 I understood well enough that anything under 100% had a chance to fail but there was a genuine feeling that anything under 100% would do so for these specific missions. A sort of hidden r.n.g. factor if you will. Good to see this wasn’t the case. I was fairly pleased when my mission was a success. Once again i fell prey to the r.n.g. gods and only when i stopped caring and expecting a good outcome, did one occur. 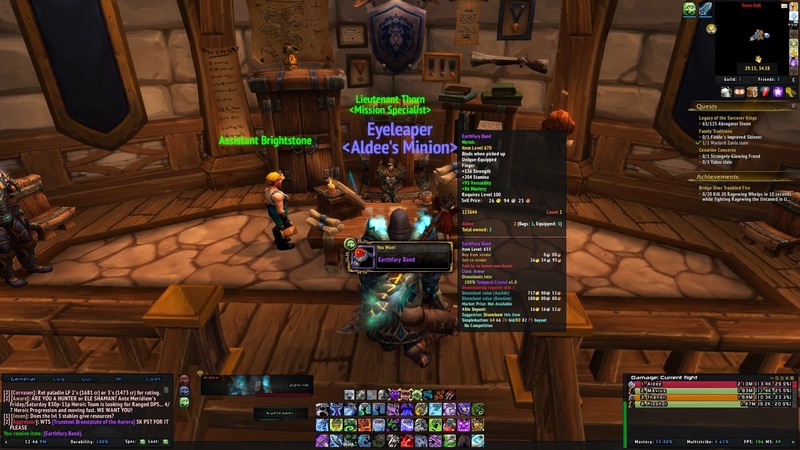 I got a nice heroic ring out of the deal which bumped my ilvl a decent amount. I’m hoping to do a better job of gearing up my followers for when another one of these missions pups up. I’m quite sure the next one that does will require another follower with traits that i don’t have.